The Pointe Venues' Grand Regal Ballroom is perfect for any type of large party that you might be planning. Our Grand Regal ballroom is an elegant room with vaulted ceilings and multiple chandeliers. We have a wood dance floor if you would like to incorporate dancing into your event. The ballroom can hold up to 150 people. Our rooms are fully equipped with audio and video capabilities. We also have premier linens and decorations available for rental. We do have full service catering with exceptional staff and cash bar available. We have a wide variety of food to choose from! The Grand Regal Ballroom rents for $360.00 for 4 hours and $600 for 8 hours. 50% deposit required when booking the event. Terms are placed in the contract. Please inquire if you would like the terms emailed to you. The Pointe Venues' Royale Room is perfect for smaller, intimate gatherings. It can be used for small wedding ceremony, wedding shower, rehearsal dinner, baby showers, birthday parties, family reunions, and more. The room is 900 sq ft and can accommodate up to 54 people. The Royale Room is easy to customize to reach your inspiration look that you want. We have full service catering with exceptional staff and cash bar available. We have a wide variety of food to choose from! No outside food or catering is allowed. The Royale Room rents for $90 for 4 hours and $180 for 8 hours. The room comes with standard setup, but any changes from standard setup by our staff requires additional fees. 50% deposit is due at the time of booking. The Outdoor Wood Deck is the perfect place for small parties. It has a great view that overlooks the golf course. 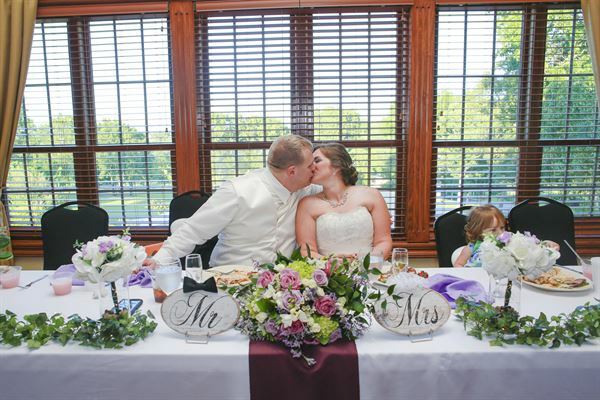 It is the perfect spot for small wedding ceremonies, birthday parties, or just getting together with friends. We have full service catering with exceptional staff and cash bar available. We have a wide variety of food to choose from! No outside food or catering is allowed. The Outdoor Wood Deck rents for $50 for 4 hours. The space comes with standard setup, but any changes from standard setup by our staff requires additional fees. 50% deposit is due at the time of booking. Terms are laid out in the contract. Please inquire for terms to be emailed to you. Our Patio is a covered, outdoor patio area that is the perfect setting to incorporate the outdoors into your event. You can choose to have string lights and chandelier to light up your event for an elegant outdoor wedding by the golf course or have a relaxing family reunion outside. We have full service catering with exceptional staff and cash bar available. We have a wide variety of food to choose from! No outside food or catering is allowed. The Outdoor Patio rents for $75 for 4 hours. The space comes with standard setup, but any changes from standard setup by our staff requires additional fees. 50% deposit is due at the time of booking. Terms are laid out in the contract. Please inquire for terms to be sent to you. Our Grand Regal ballroom is an elegant room with vaulted ceilings and multiple chandeliers. We have a wood dance floor if you would like to incorporate dancing into your event. The ballroom can hold up to 150 people. Our rooms are fully equipped with audio and video capabilities. We also have premier linens and decorations available for rental. Our Outdoor Deck is a great small space that is perfect for any small party that you are looking to throw. It can hold up to 20 people. Relax with friends while overlooking the golf course or choose it to be the perfect spot for a small wedding ceremony. This space can be customized for whatever you are looking for. Our Patio is a covered, outdoor patio area that is the perfect setting to incorporate the outdoors. You can choose to have string lights and chandelier to light up your event for an elegant outdoor wedding by the golf course or a fun family reunion! The Pointe Venues' Royale Room is perfect for smaller, intimate gatherings. It can be used for small wedding ceremony, wedding shower, rehearsal dinner, baby showers, birthday parties, family reunions, and more. The room is 900 sq ft and can accommodate up to 54 people. The Royale Room is easy to customize to reach your inspiration look that you want.